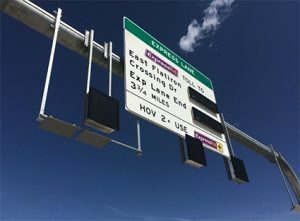 Transportation projects in Colorado and Idaho honored as best in U.S.
A multimodal project in Colorado that installed advanced technology to speed emergency responses and added new travel options including a commuter bikeway and a project in Idaho that removed the last of 18 dangerous intersections were both honored as the top winners in the 2017 America’s Transportation Awards competition. The Colorado Department of Transportation’s $487 million U.S. 36 Express Lanes project earned the Grand Prize and the Idaho Transportation Department’s $11.2 million U.S. 20 Thornton Interchange project was voted the People’s Choice Award winner, in the 10th annual competition sponsored by the American Association of State Highway and Transportation Officials, AAA and the U.S. Chamber of Commerce. Colorado DOT’s US 36 Express Lanes project between Denver and Boulder included the installation of intelligent transportation systems for incident management, tolling, transit, and traveler information, along with the replacement or widening of 13 bridges, the addition of bus rapid transit lanes and a commuter bikeway. The Idaho Transportation Department’s US 20 Thornton Interchange project earned nearly half of the more than 75,000 online votes cast in the People’s Choice Award competition. Located in rural eastern Idaho, the Thornton project was the last of seven new interchanges built in the past 17 years to provide safe access to and from a 34-mile stretch of U.S. 20. The 2017 competition attracted a record 92 project nominations from state transportation departments in 39 states and the District of Columbia. Four regional competitions were held and the three projects from each region receiving the highest ratings competed for the final two awards. An independent panel of industry judges selected the Grand Prize winner and the project receiving the highest number of online votes earned the People’s Choice Award. Presented at the AASHTO Annual Meeting in Phoenix, the Grand Prize and People’s Choice awards came with $10,000 cash prizes to be used to support a charity or transportation-related scholarship program.